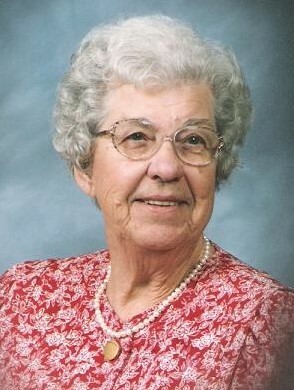 Ruth Evelyn Presley Puckett, age 98, was born August 18, 1920 in Louisville and passed away Monday, February 4, 2019 in Sunrise Manor, Hodgenville, KY.
She was a former active member of Clarkson Methodist Church in Grayson County and enjoyed her flower gardens and needlework. Preceding in death were husband Hubert Lowell Puckett Sr, who she married Jan 5, 1935 in Munfordville, son Dr. Hubert Lowell Puckett Jr., parents Isaac and Ollie Poston Presley, grandson Harry Thomas Sansbury Jr., 2 brothers Ivan Presley and Paul Presley, 6 sisters Katherine Middleton, Esther Ruark, Eloise Brown, Dorothy Nunn, Alline Crenshaw and Berladean Schindler. Survivors include daughter Doris Sansbury, son Vincent Leon Puckett Sr. three granddaughters Stephanie Bennett, JoAnn Jackson and Cindy Groesbeck, three grandsons Vincent Puckett Jr., Randall Puckett, Martin Puckett, a brother George Presley, a sister Edith Bastin, and numerous great-grandchildren, nieces and nephews. Visitation: Friday, February 8, 2019 from 11:00 AM CST to 1:30 PM CST at Rogers-Oller Funeral Home until time of service. Funeral services will be on Friday, February 8, 2019 at 1:30 with Rev. Robby Ward officiating; burial will be at a later date at Louisville Memorial Gardens West.